Eragrostis pectinacea plants in bloom. R. Schipper. 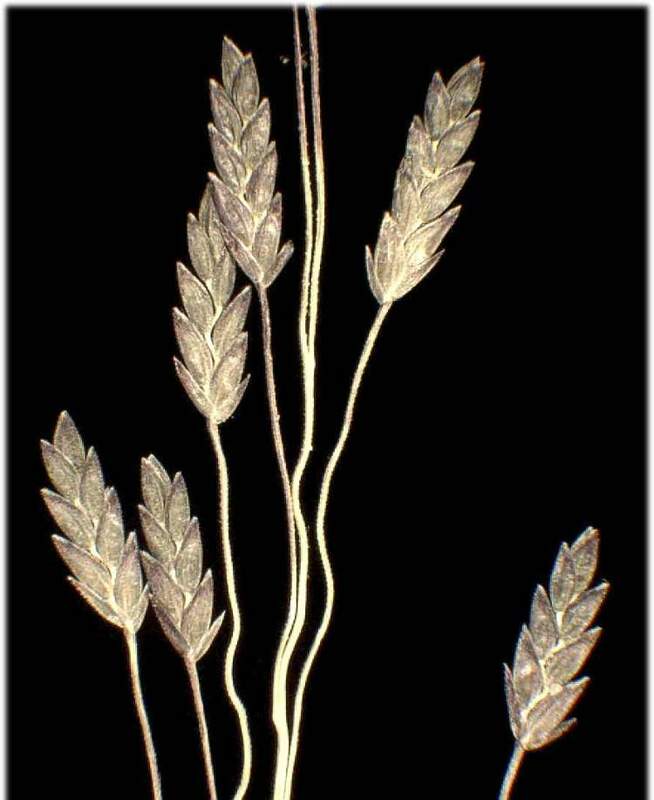 Herbarium, /University of Michiga, michiganflora.net (Accessed 5/2018). 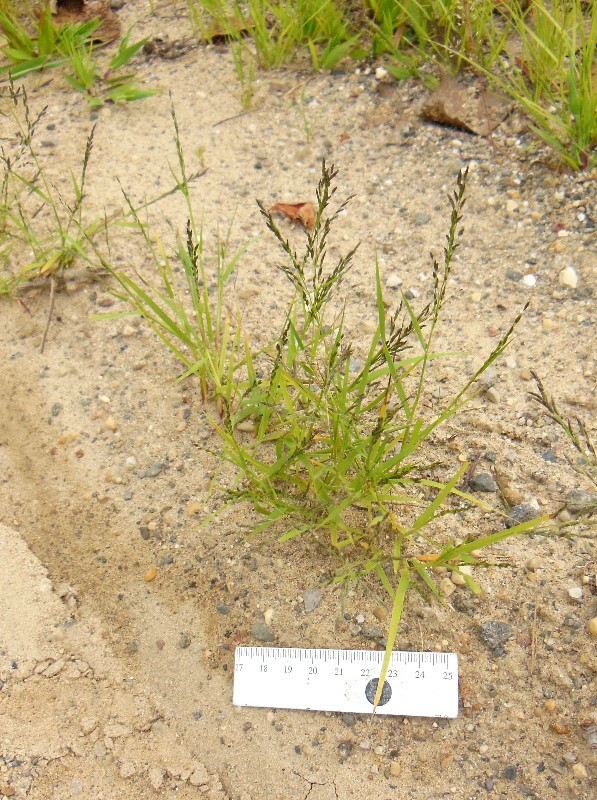 Eragrostis pectinacea is an annual C4 grass (Ludwig et al. 2010), slender, short, densely tufted, 10-60 cm tall, erect, or bent only at base, often branching from lower nodes, sheaths shorter than internodes, top of sheath with long-hairy lobes, ligule a band of short hairs. 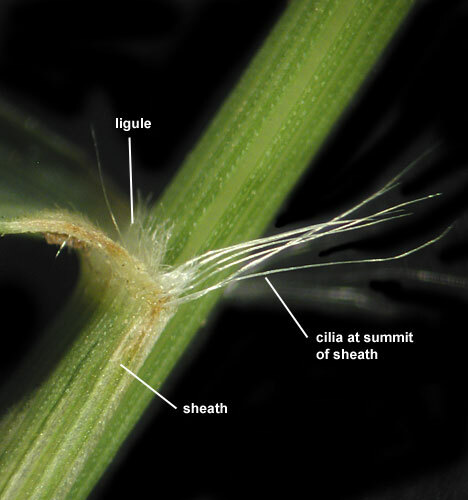 Eragrostis pectinacea ligule and sheath. Billy E. Warrick, Ph.D. Texas Cooperative Extention Service. Soil, Crops, and more Information. soilcropsandmore.info (Accessed 5/2018). Leaves alternate, 2.5-10 cm long (Hilty 2006), 0.1-0.4 cm wide. Eragrotis pectinacea spikelets. Picture by Andrea Moro – Troy sur Loire, Dipartimento Nièvre, riva destra della Loira., Francia, – Image licensed under a Creative Commons Attribution Non Commercial Share-Alike 3.0 License.luirig.altervista.org (Accessed 1/2017). Flower spikelets small, 0.5-0.8 cm long, 0.1-0.2 cm wide, gray 6-15 flowers , glumes much shorter than spikelet, keel minutely toothed, lemmas 0.1-0.2 cm, grain to 0.1 cm, palea persistent on spikelet axis; inflorescence 5-25 cm long, usually 1-2 branches per node, diffuse, delicate, bearing spikelets from near base, spikelet stalks appressed to branch; blooms and fruits July-Oct.
Habitat: Open, moist sandy soil, ditches, disturbances.